Our guest, Candy Thorsen, joined us for a special Farmville Storytime. The featured stories were "Jack and the Beanstalk," and "Soybeans, A to Z." The soybean book was donated by the Soybean Growers Association and presented to the library by the PBL FFA. Ms. Thorsen talked to the children about the importance of soybeans as ingredients in everyday items. 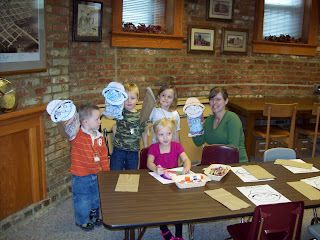 She also provided them with new coloring sheets and helped make soybean necklaces and farmer puppets to take home.